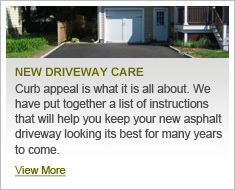 Bridgeport Paving specializes in developing residential asphalt driveways. Our expert and dedicated staff can handle any paving job that you need, whether it is the full replacement of your asphalt or concrete driveway, or any sidewalk or walkways you need replaced or constructed. The depth and range of our work enables us to effectively address every client’s needs. We look at each client and project uniquely and draw on our vast experience and wide range of services to meet their requirements. Bridgeport Paving is a licensed, bonded and insured construction company that has done work for many types of commercial property owners, from multi-family residences and "mom and pop" stores to apartment buildings and major developments including shopping malls. Our dedicated team is experienced in completing projects on time and within budget. We are a minority contractor registered with the Connecticut State Department of Administrative Services.